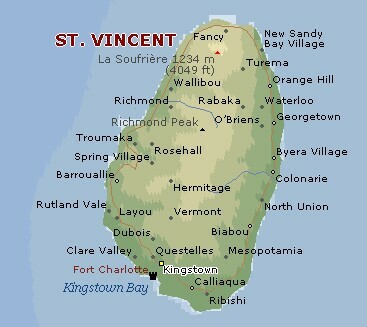 Population: Just over 115,000 in the whole country, with over 90% on St. Vincent. Money: Eastern Caribbean (EC) dollar, tied at $2.67 to the US dollar. Landscape: High, volcanic island. Soil is very fertile, with lots of rainforest and plantation land. We sailed past St. Vincent on July 6, but stayed in the St. Vincent Grenadines off and on for several weeks in July and August, 2002. History: St. Vincent was inhabited at least 7,000 years ago by the Ciboney people from South America. About 2,000 years ago, Arawaks replaced the Ciboney. Less than a 1,000 years ago, Caribs overran the island, and when the Spanish first sighted St. Vincent, it was densely populated with Caribs. Many of these were refugees from the islands to the north, and their resistance kept the island free of Europeans long after most of the others were well settled. The first major foreign influence occurred in 1675, when a Dutch slave ship sank near the island, and although all the Europeans died, many Africans made it to shore and were welcomed. They began taking Carib wives, and their children were know as Black Caribs, as opposed to the native Yellow Caribs. As the Black Carib population increased, tensions began between the two groups, resulting in the creation of separate settlements. Both Carib groups disliked the Europeans, but they were more tolerant of the French than the British. The Caribs allowed the creation of a small French colony in the early 1700s, but the British and French exchanged claims to the island for almost a century. After the Treaty of Paris placed St. Vincent under British control, both Carib groups rebelled. The rebellion, which the French instigated, saw both Black and Yellow Caribs simultaneously sweeping the island, torching plantations and killing Europeans. They joined forces, and the leader of the Black Caribs fought a sword duel with the British commander. The chieftain died in the the duel, but the commander died a short while later (not uncommon in those days). More British troops were sent, and they forcibly relocated the Caribs. The colony then grew with much the same success as the others, but in 1812 and 1902 a volcano in the north, La ere, had major eruptions, and, combined with a powerful 1898 hurricane, essentially destroyed the plantation economy. For the next 80 years the economy stagnated until St. Vincent and the Grenadines became independent on October 27th, 1979. (Jon) We didn't actually set foot on the island of St. Vincent this time. It has few good anchorages, little worth seeing (except perhaps the botanical gardens, reputedly started by Captain Bligh), a poor reputation with cruisers (aggressive boat boys, etc. ), and we had friends waiting for us in the much more delightful islands to the south. So this time we just made the long (about 60 mile) passage from St. Lucia down the windward side of St. Vincent and into Bequia (pronounced BEK-wee). We often sail down the windward sides of the bigger islands because there is no wind on the lee (west) side, forcing us to motor. 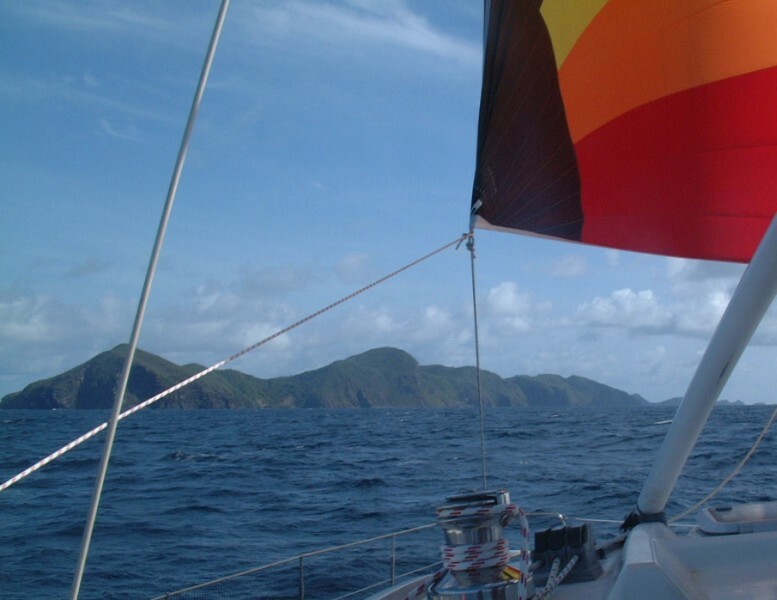 On this particular passage the winds were light so we were able to fly our spinnaker down the cut south of St. Vincent and into Admiralty Bay, Bequia. Very colorful! 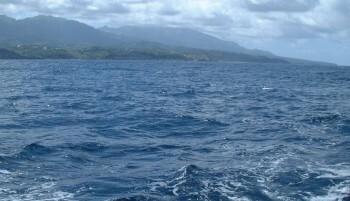 (Sue) I always sail past St. Vincent with a bit of longing. I remember visiting there in the early 1960's with my family. It's a lush, mountainous island, and the botanical garden is fascinating. I still recall hearing the story of how Captain Blight brought the first breadfruit seeds to the islands. Descendents of the original tree still grow here. Anyway, the longing is tainted with bewilderment that the St. Vincentian's still vote in a government that is decidedly anti-tourism, and with that attitude the place is not only unfriendly but unsafe for visiting cruisers. The surprising thing is that the lovely little Grenadines islands to the south of the main island of St. Vincent are totally geared up for cruisers and tourists and have a 180 degree different opinion of visitors. Strange. Some day maybe they'll get a clue. Till then we, like hundreds of other boats, will sail on past.